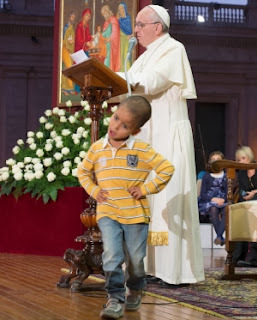 Student: Although it must be considered heretical, I believe, to assert that the pope does not have coercive jurisdiction over others, state nevertheless how the aforementioned theorists attempt to prove this. Student: Do not multiply arguments in favour of this view, and propound the reasons of those who say that the pope has a superior on earth. Master: Some try to demonstrate that the pope has a superior judge on earth even when he remains a pope, and they adduce many arguments. But they have different ways of putting this. For some say that the emperor or another judge and secular ruler, or the people or some multitude, is the normal judge of the pope. 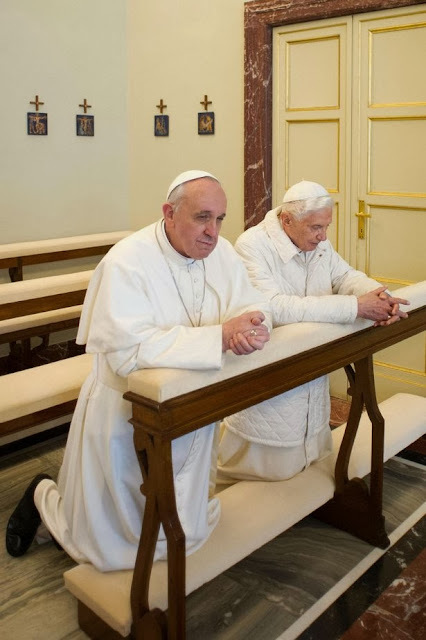 While others say that neither the universal church nor any other congregation or person has the power of summoning or coercing the pope except in two cases. The first is if the pope were seriously if falsely slandered of heresy, the second is if he were notoriously involved in some crime which would scandalize the church and showed himself to be incorrigible. The comet that portends the fall of thrones. Lucan, Phars. i. 529 (L. C. L., p. 40). Nice Art Work? Anders Behring Breivik Is A Modern Day Noah?? The very first tweet 9 September 2013: KNUS MULTIKULTURALISME! 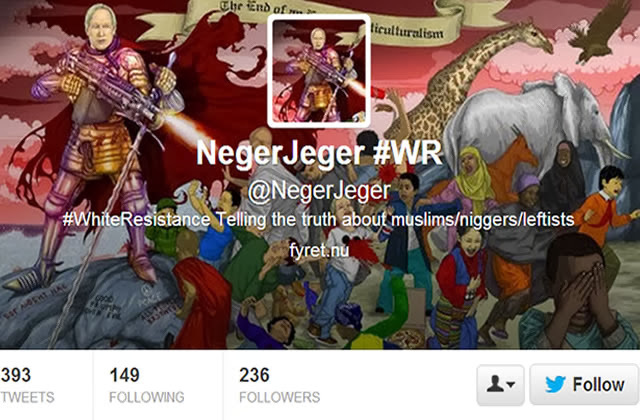 — NegerJeger #WR (@NegerJeger) September 9, 2013 Has made about 444 tweets since then. Most of the tweets are against blacks and Muslims and religion. Deadly Natural Disasters For The Third Week November 2013: Nature Takes Vengeance On Account Of Pope Francis The Destroyer! Little Trick Of Heretics At The National Catholic Register To Give The Appearance of Othorodoxy By Quoting St. Thomas On Non-Doctrinal Matters Like Beauty! Beauty Paris Hilton Create Nightclub, Los Angeles 8 Oct. 2013 Question the beauty of the earth, question the beauty of the sea, question the beauty of the air distending and diffusing itself, question the beauty of the sky. . . question all these realities. All respond: "See, we are beautiful." Their beauty is a profession [confessio]. These beauties are subject to change. Who made them if not the Beautiful One [Pulcher] who is not subject to change? St Thomas AquinasThe above quote from St Thomas is not too controversial - is it? Here's the trick always quote from St. Thomas Aquinas on all things non-controversial and all will think you are doctrinally sound. So when you spread a little heresy no one will catch on because after all you quote from St. Thomas Aquinas! Actually you just cut and paste from the Summa - you don't have to believe a word of it ,especially the hard stuff, and everyone will wonder at your wisdom. 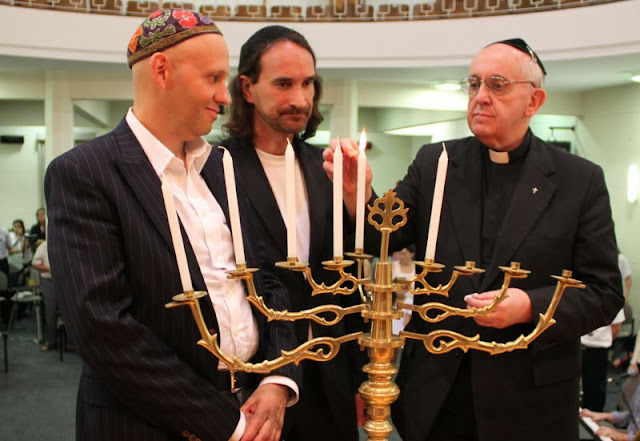 Rabbi Noam Marans "Cardinal Jorge Bergoglio Was A Regular In Synagogue"
Let us pray also for the Jews that the Lord our God may take the veil from their hearts and that they also may acknowledge our Lord Jesus Christ. Let us pray: Almighty and everlasting God, You do not refuse Your mercy even to the Jews; hear the prayers which we offer for the blindness of that people so that they may acknowledge the light of Your truth, which is Christ, and be delivered from their darkness. Through the same our Lord...Pray for the conversion of the Jews?......Well maybe not under Pope Francis the Destroyer. 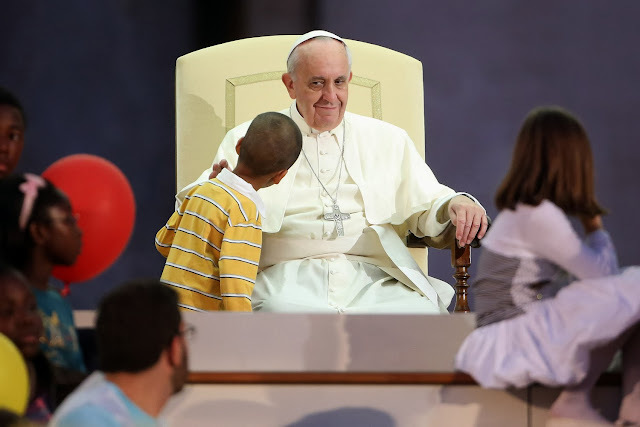 “For Pope Francis, this is just part of his life. He was a regular in shul (synagogue),” Rabbi Noam Marans, director of interreligious relations for the American Jewish Committee, a policy and advocacy group based in New YorkWP More>>>>Pay Attention! Roman Catholic Bishop Thomas John Paprocki Performs Exorcism Against The Wind? Deliver Us From Evil? 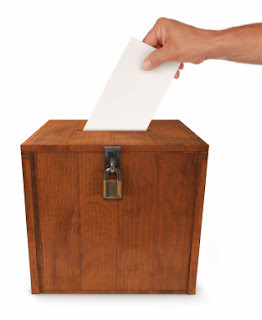 How About Deliver Us From The Ballot Box! Our Lady Of La Salette Prophecy On The Dead And The Righteous Will Be Brought Back To Life Has Been Fulfilled! If any of you believe that Our Lady told the above to Melanie, I bet your wondering how the risen dead will be made to manifest themselves to us. I too wondered how these words would be fulfilled. 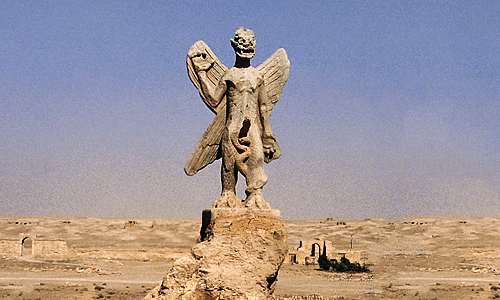 Maybe the bones of George Washington will rise up from the grave and be animated by a devil. 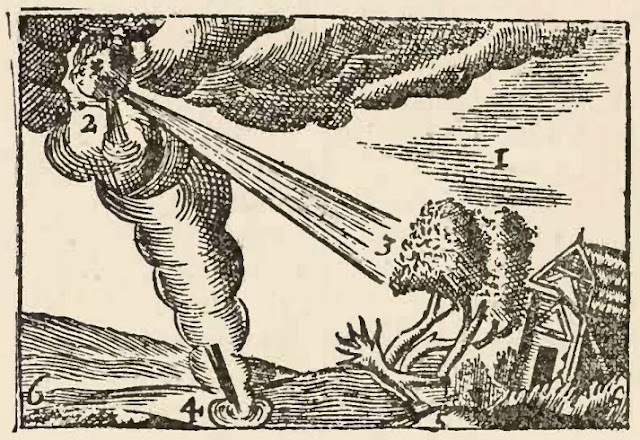 But that seems a bit much, and many would probably not believe such a manifestation. 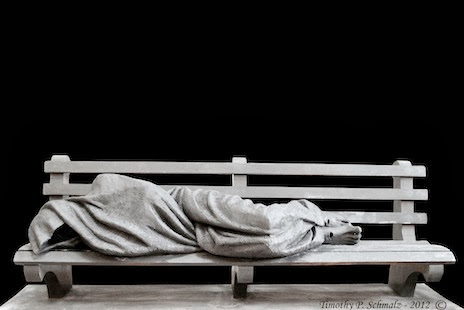 (Vatican Radio)A striking sculpture of Jesus, depicted as a homeless man sleeping on a park bench, was presented to Pope Francis following the general audience in St Peter’s Square on Wednesday. The unusual art work was brought over from Canada by sculptor Timothy Schmalz who has been exploring the contemporary face of Christian art for over two decades. The large bronze sculpture was inspired by an encounter the artist had with a homeless person on the streets of Toronto several years ago, an experience that brought new insight into the Gospel passage about caring for the hungry, the thirsty, the naked and the strangers in our midst. Just before the audience, Philippa Hitchen sat down with Timothy Schmalz to find out more about his work, his faith and his gift for the Pope…. "...what the Gospels and what Christianity provides is an endless well of creative possibilities.....what I try to do is come up with new perspectives on these eternal truths...."
Demonic Infiltrator Mark Shea Belittles Private Revelation At Fatima Yet Promotes The Private Revelation Of Sr. Faustina And Her "Divine Mercy"
Antichrist No Visible Wounds No Sacred Heart Only Rays Of Light! For such false apostles are deceitful workmen, transforming themselves into the apostles of Christ. And no wonder: for Satan himself transformeth himself into an angel of light. 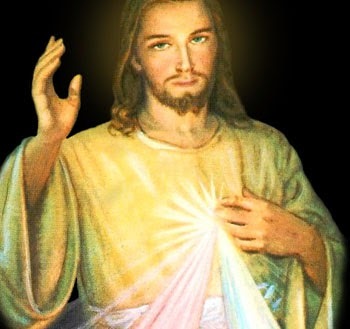 "Divine Mercy" rays of light as in Satan transforming himself into an angel of light or better yet the forerunner to the antichrist emanating his rays of light on all - his rays of "Divine Mercy" aping the things of God, aping the Sacred Heart. Pius XII placed the writings of Sr. Faustina on the Index Librorum Prohibitorum (Index of Prohibited Books).